Happiness is infections…but happiness is not a word that we can understand by looking it up in the dictionary. Every day, Americans are bombarded with problems and aignst. Happiness seems elusive. Why? We’ve got shelter, heat, tv, weekends, and based on the average waist line plenty of food. 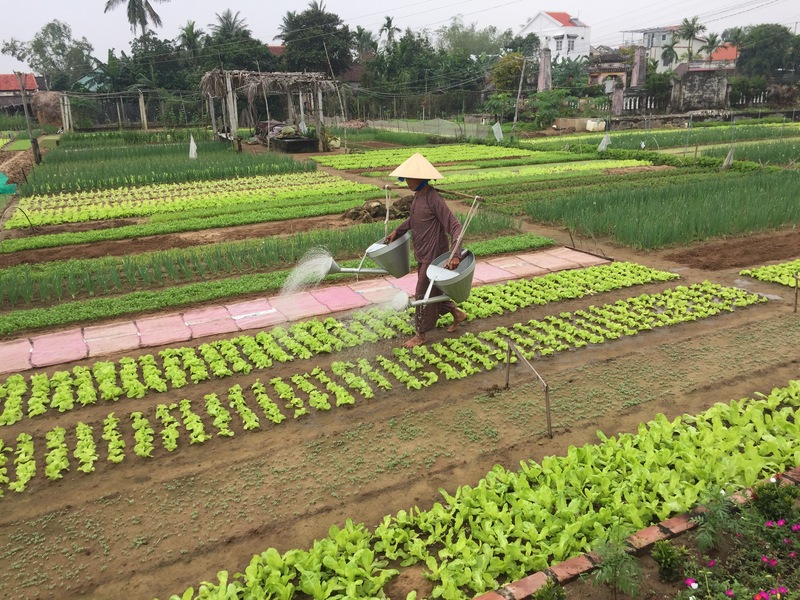 Vietnam is offerring a good perspective of what is enough. I’ve always thought pain is relative; of course if it’s happening to you, it is obviously worse than the other guy. 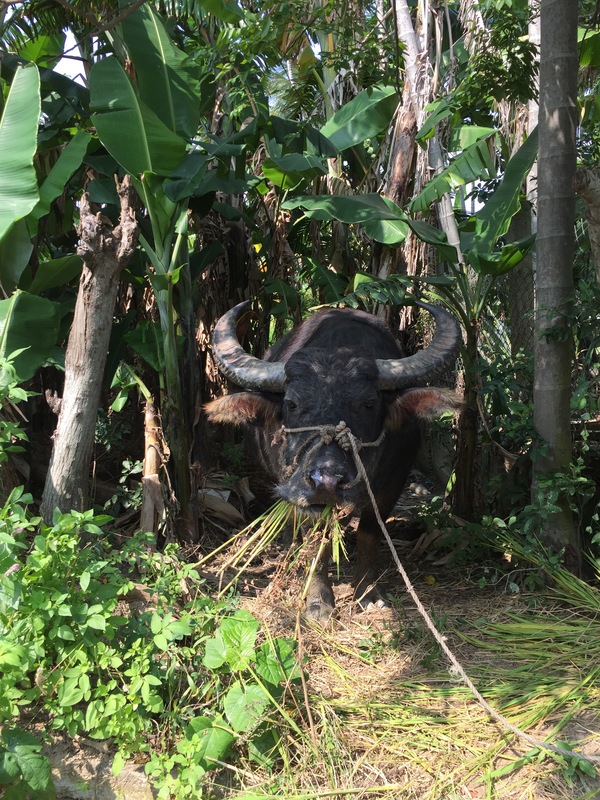 Americans complain – “I can’t believe I don’t get more vacation time; My tv is not big enough; my car is so old; blah; blah; blah.” Travel to Vietnam, spend a day with a local farmer and you will see what hard work and attention to detail looks like. Working a rice field brings my complaining that the tractor A/C and radio not working a little into perspective. While the pain of riding in a hot tractor may seem unbearable, this guy’s view doesn’t change all day. Hmm…now that tractor with the broken A/C is not looking so bad. 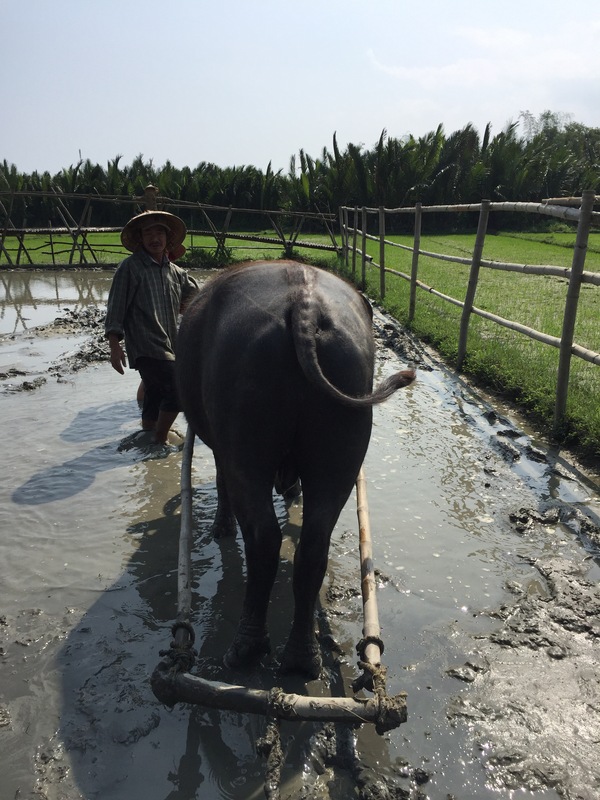 Something amazing with this pic here though that guy leading the water buffalo; he’s HAPPY. 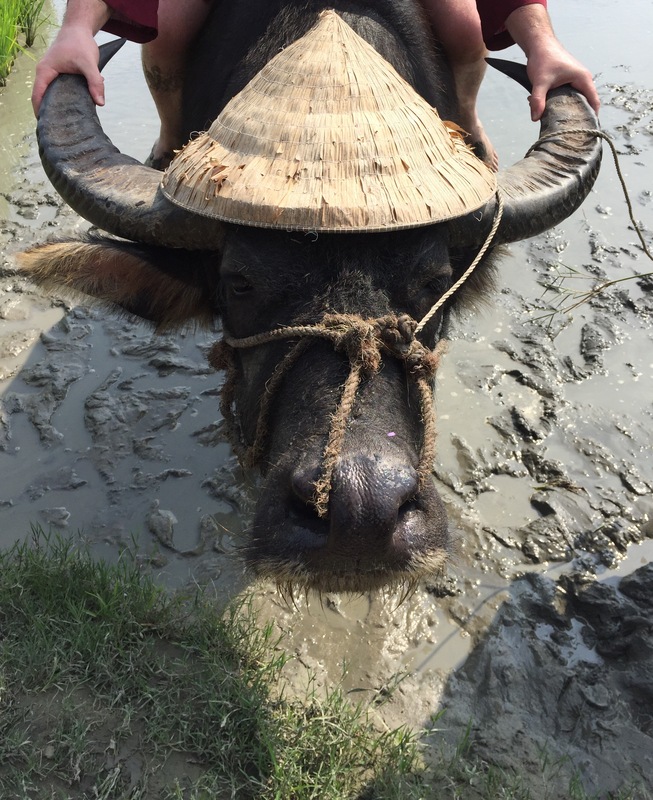 He’s happy because that water buffalo is a good working animal that makes his rice fields productive. Plus crazy tourist from far away pay him to play in the mud! Just look at the appearence; neat, clean, lush. Keep in mind, that all of this field is not hers. At just about 1/10 acre total, she’s gettin work done. Contrast this to home, where many people, including myself will plant a garden, only to let the weeds and bugs take it. Abundence breeds complacency. It’s funny though as our tour guide speak in admiration of fairer skin while we have hoards of people who pay to be tan like they are. How they just would like one curl in their hair, or a “big nose” like we do. ¿¿¿¿¿A big nose???? Never thought of that as an endearing trait of Americans. I guess we humans are all the same – we want what we don’t/can’t have. This brings me to my next observation – the graciousness of the people here. Everywhere we have been, people are genuinely appreciative of your business and time. Contrast this to my most recent visit to nameless fast food restaurant back home, where the drive through attendent could not be bothered to give me the total, thank you, hello, and certainly not a smile (I thought they were free). Almost as if I had inconvenienced her. Here, we are told thank you for everything. They realize that you spending money here represents time that you had to spend to earn the money working to come to visit them. At the end of the day TIME is the great equalizer; we’ve only got so much of it. 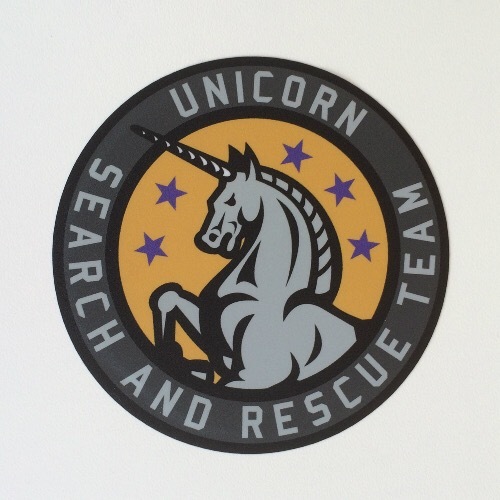 I’m not saying that life in Vietnam is rainbows and unicorns (official member of Search & Rescue Team here BTW). Agreed! This was so fun to read.